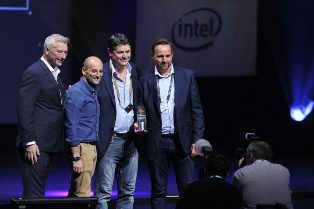 White Light is thrilled to announce that its project with Discovery and Eurosport entitled “Eurosport Cube” has been awarded the IBC Innovation Award 2018 for Content Creation. The Cube is an immersive, mixed-reality studio built by WL, alongside technical partners disguise and Deltatre, and was utilised throughout Eurosport’s international coverage of the 2018 Olympic Winter Games. Housed in the International Broadcast Centre in PyeongChang, South Korea, the Cube offered a fully interactive environment in order to analyse the Games’ action. Built entirely from LED display technology and using augmented and virtual reality, it enabled Eurosport experts to interact with their surroundings, telling more engaging stories that explained the technical aspects of the different sports. Coupled with disguise’s media platform, Vizrt and camera tracking solutions, the background of the Cube could be generated to the perspective of the viewer in 3D. The IBC2018 Innovation awards recognise innovation within the media, entertainment and technology industry and this year celebrate excellence in sport and news, multi-national delivery, new ways of engaging audiences and new business models to maximise revenues. Michael Lumley, chair of the IBC Innovation Awards judging panel said, “This year’s IBC Innovation Awards shortlist is a real global snapshot of the cutting edge of our industry, with all the hot topics of the moment represented, and entries from practically every corner of the globe”.